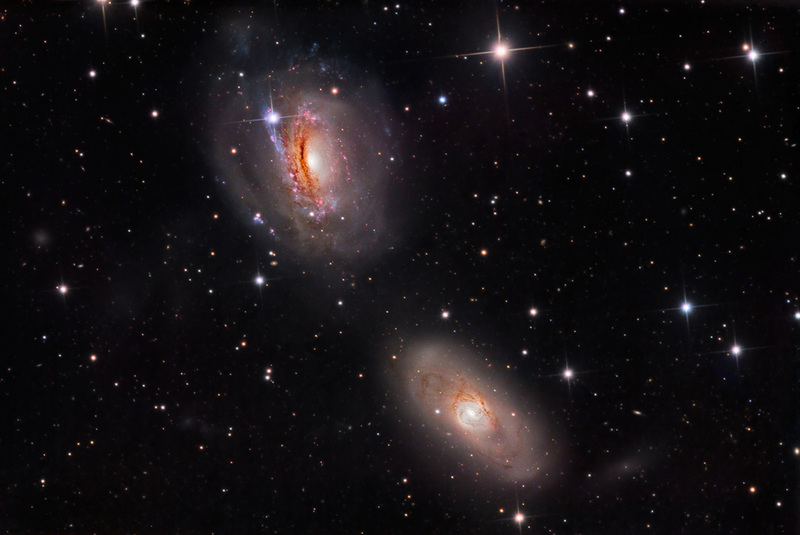 are a gravitationally bound galactic pair, discovered by the great William Herschel in 1783. Approximately 65,000,000 light years distant but only 50,000 ly apart, both unusual galaxies exhibit signs of their tidal interaction. The filamentary arms of NGC 3169 (11 o'clock) have been pulled away from its small nucleus to form a spectacular extended bubble. NGC 3166 (5 o'clock) is also odd in that spiral structure is only evident in its very bright core. While 3169 is alive with new star birth as evidenced by its dust lanes and bright blue stars, 3166 with its dim extended envelope is by comparison, asleep. This data was acquired in 2015 at SSRO, and was NASA's APOD for 11-6-15.